The American Museum of Natural History in New York said Monday it is not the "optimal location" for a gala honoring the president of Brazil. Environmental organizations had pushed for the event to be moved. "The decision echoes the museum's institutional values and its tireless quest for truth through science and education, which is the exact opposite of all the Brazilian President stands for," said the Brazilian environmental organization Observatório do Clima. The museum had rented the gala space to the Brazilian-American Chamber of Commerce for its annual Person of the Year Awards Gala Dinner. Previous honorees have included Bill Clinton and Michael Bloomberg. On Thursday, AMNH stressed that it had not been aware Bolsonaro was to be the honoree when the event was booked by the nonprofit group that promotes "trade, investment, and cultural ties between the two nations." The museum said: "We are deeply concerned, and we are exploring our options." Two days later, the museum seemed even more clear about its unease about the event: "We want you to know that we understand and share your distress." Employees also voiced their concerns about the event to management. On Monday, the museum put out a joint statement with the Brazilian-American Chamber of Commerce. "We jointly agreed that the Museum is not the optimal location for the Brazilian-Am. Chamber of Commerce gala dinner," it said. "This traditional event will go forward at another location on the original date & time." It's not clear where the May 14 dinner will be held, though the chamber's website says it will happen at an "upscale venue" that will be announced soon. The chamber says it chose Bolsonaro as its person of the year as "a recognition of his strongly stated intention of fostering closer commercial and diplomatic ties between Brazil and the United States and his firm commitment to building a strong and durable partnership between the two nations." Bolsonaro has suggested changing rainforest protections to allow for development. Recently, he said: "Environmental politics can't muddle with Brazil's development. ... Today, the economy is almost back on track thanks to agribusiness, and they are suffocated by environmental questions." 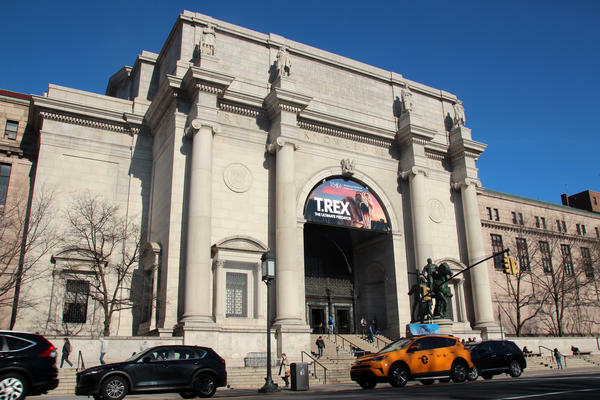 New York Mayor Bill de Blasio applauded AMNH's move "on behalf of our city." He said: "Jair Bolsonaro is a dangerous man. His overt racism, homophobia and destructive decisions will have a devastating impact on the future of our planet."